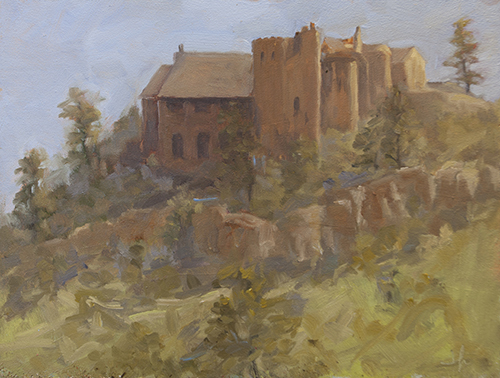 Artists of all levels are welcome to join our exclusive “Arts Afield” program to draw and paint the private land, buildings and incredible vistas found only at Cherokee all ‘en plein air’. This is a wonderful venue that very few get to enjoy. Whether you are an experienced artist of any medium or just want to give outdoor art a try, this is an outing you will never forget. Annual Arts Afield annual membership for 2018 – $150 includes access to all scheduled Arts Afield days, an opportunity to showcase a few pieces from your work at a show in Cherokee Castle- (December to January) and one ticket to the Artist Reception event in December. Individual Arts Afield days – $30. All Arts Afield outings meet at the parking lot located up by Cherokee Castle. You will meet the event leader at 9:00am sharp and they will guide you to that day’s painting location. You may paint in that area until 2:00pm. Bring appropriate clothing, footwear, water, lunch, and all of your painting equipment. Many locations are accessible by car, while some require a significant hike while carrying your gear. Access is indicated on the calendar as “CAR ACCESS” and “HIKE ONLY”.